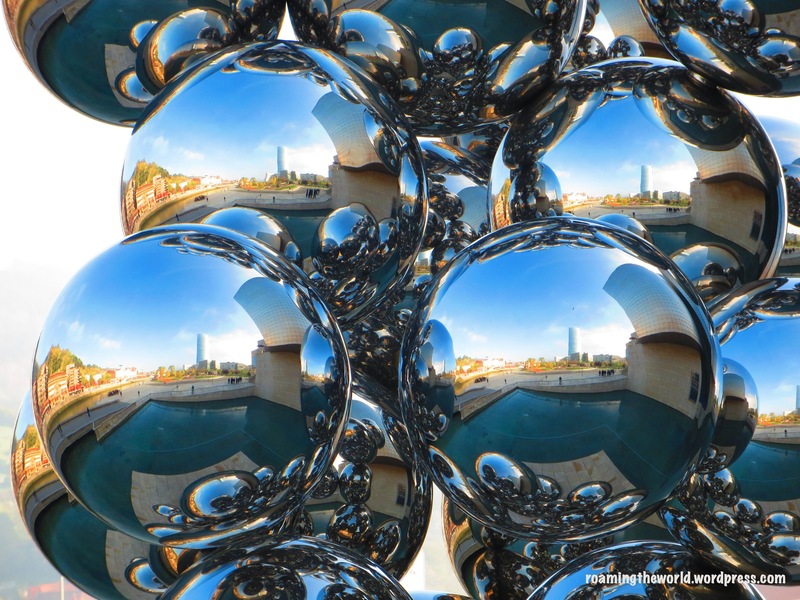 On an unexpected school field trip to the Guggenheim museum in Bilbao, I quietly captured photos of the art that surrounds the museum while students posed for photos with friends. Admiring a silver bubble-esque statue that arises from a rectangular pond outside the museum, I pondered the artist’s creation. Unable to get closer to the art due to a railing to prevent you from falling in, I peered through my camera lens and zoomed in and realized this art piece is more than just what meets the eye on first inspection. The surrounding sights- river, wave-like metallic museum and visitors all become part of the piece. A piece that stops you and reminds us to take a moment to enjoy, appreciate and reflect about what is going on around you. The Guggenheim is open Tuesday- Sunday from 10 am to 8 pm and is open everyday July and August. General admission is 13€ with discounts for students under 26 and retirees. An Audio guide included for museum patrons to enjoy a self-guided tour about the history of the museum, architecture and some of the exhibits. You can enjoy the sculptures outside the museum anytime! Lauren David writes at Roamingtheworld, which began in 2007 when she set off with a one-way ticket to travel from Eastern to Southern Africa solo. Nine months later, she accomplished a dream and stayed put in the San Francisco area until she got itchy feet 3 years later and moved to Andalucía, Spain in 2011. She’s traded sunny skies, free tapas for picturesque landscapes and occasional snowstorms in Basque country. Her blog is about life as an expat, travels, food, and the unexpected. Visit her atRoamingtheworld and follow her on Facebook. Thanks for featuring me Cat! The Guggenheim is fantastic! I was there on a trip in high school. The building and art surrounding it was nearly as wonderful as the art on the inside. If you don’t want to pay the admission price, make sure you at least take in the entire outside of the museum.